Author Stephen Spinks argues that Edward and the later murdered Piers Gaveston were lovers, not merely `brothers-in-arms'. Influenced by successive royal favourites and with a desire for personal vengeance, his rule became highly polarised and unstable. His own wife took a lover and invaded his kingdom resulting in his forced abdication; the first in British history. 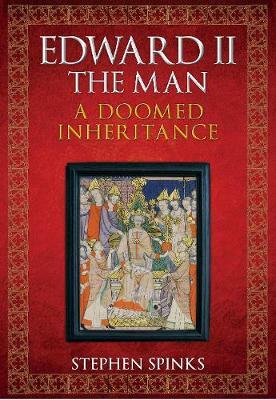 Edward's prevailing legacy remains the warning that all kings can fall from power. And yet ... war, debt and baronial oppression before 1307 ensured that Edward II inherited a toxic legacy that any successor would have found almost impossible to wrestle with. Stephen Spinks explores that legacy using contemporary and later sources. By focusing on Edward's early years as much as on his reign, and exploring the conflicting influences of those around him, Stephen shows the human side of this tale against a backdrop of political intrigues and betrayals. He peels back the layers to reveal the man who wore the crown. Edward's belief in his unchallengable right to rule, increasingly at odds with those at his court, and his undeniable thirst for revenge, creates a fourteenth-century tragedy on a grand scale. Stephen Spinks wrote his dissertation on Edward II while studying at King's College, London. He works for the National Trust and manages three Medieval heritage sites with 900 volunteers and 150 staff. He is a columnist for 'Midlands Zone' magazine, in which he writes a very well received exploration of life as a gay man today, partly political, partly personal. He has given many interviews on radio and in his capacity at the National Trust, to 'BBC's Escape to the Country' and the 'Antiques Road Show'. He has been studying the primary sources (and locations) for this book over the past 15 years.